Leave a Comment on How to root OnePlus 5T, install TWRP and Unlock Bootloader? OnePlus 5T is now the manufacturer’s latest flagship phone. It was just launched last week and now available for sale in many major countries. Moreover, the OnePlus 5T just received yet another Oxygen OS 4.7.2 OTA update. The device is still running the former Android 7.1.1 Nougat firmware. The OnePlus 5/5T are reported to receive 8.0 Oreo update this month with the first Open Beta build. At the beginning next year, the official Oxygen OS 5.0 will be released. Hence, this tutorial will come in handy in rooting not only the 7.1 Nougat, but also the upcoming 8.0 Oreo for OnePlus 5T. There could be several reasons why you would like to root your Android phone. One of which is that you simply can. Now, OnePlus is the only manufacturer which is open for development and rooting won’t void the device warranty. Don’t believe me? You can straight up ask OnePlus support and they will say the same thing. However, you need to be careful about the procedure. As rooting, installing a custom TWRP recovery, or even flashing a custom ROM like Lineage OS may get tricky for beginners. Hence, here is a handy tutorial on how to Unlock Bootloader, install TWRP recovery, and root OnePlus 5T. Installing Magisk, and much more. Method 1: How to Unlock Bootloader, install TWRP recovery, and root OnePlus 3T? This procedure may feel complicated to some. It requires a bit of technical knowledge like ADB, Fastboot, etc. The procedure is same as that of the previous phones like OnePlus 3/3T. The ony difference is that you will need a TWRP recovery specific to OnePlus 5T, and the latest versions of SuperSU or Magisk. Here are some videos we have made on rooting OnePlus 3/3T which will come handy. The steps are same. You just need to use different files. How to install TWRP and root OnePlus phones? Enable OEM Unlock, USB Debugging, and Advanced Reboot on your Android device. Enable Developer Options by going to Settings > About Phone > Tap on the Build Number several times. Trust the connection by allowing it when you connect it to your PC for the first time. 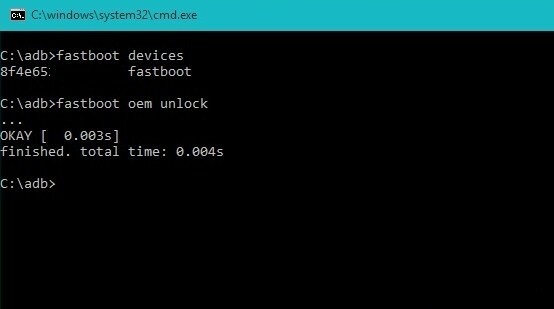 Setup ADB and Fastboot on your PC. Download the 15 second ADB and Fastboot. The first thing we are going to do is unlock the Bootloader. Be sure to go through the requirements from above. Later, we are going to install TWRP recovery. Finally, you can either flash Magisk or SuperSU as per your wish. Both magisk and SuperSU have theire own benefit. But they will both gain root access to your device. Note: To bypass the Forced Encryption and DM-Verity, flash the Decrypt zip listed above. Step 1: Download all the files from the download section above and transfer them to your PC. Also, keep a copy of the files in phone storage like SuperSU, Magisk, DM-Verity zip, TWRP, etc. Step 2: Connect device to PC and trust the connection by checking “Always allow from this computer” when you plug in Android device for the first time. Step 3: Now keep the Android device plugged in and open a command prompt or terminal on your PC. You can simply click the address/location bar in Windows and type “cmd”. Alternative: Hold the shift key on the keyboard and right-click on an empty space and select “Open command window here” option to launch a cmd window. Note: Reboot, and check the unlock status again. If the status is locked, then continue to unlock it. Step 8: Now reboot back into the Fastboot mode (Bootloader mode) See steps 1 to 5 above. Both SuperSU and Magisk are rooting tools. Both have their own benefits. Use only one of the two. Read the benefits of Magisk from here. Transfer SuperSU or Magisk package to OP 5T storage. Reboot OnePlus 5T into TWRP recovery. To do so, turn off your device completely and hold volume down and power buttons for a few seconds. Now, tap on the Install option and select the SuperSU/Magisk file. For a detailed tutorial on how to use TWRP – click here. Method 2: How to root OnePlus 5T using the All in One Toolkit? This OnePlus 5T Toolkit is a graphic tool designed for various operations for visual learners. The operations including unlocking bootloader, root, flash TWRP, flash OTA & flash factory images, etc. with a few clicks. All the options are automated and all you have to do is follow the instructions. Functions of the OnePlus 5T AIO Toolkit? Open the OnePlus 5T Toolkit. Connect the OnePlus device to PC. That’s it. Follow and like us on social media. For queries either comment down below.